Who, at the first sign of frost, doesn't long to be wrapped in an oversized cashmere throw, sit by the fire, grab a good book, and sip something spiked and fragrant while the snowflakes outside are dancing the polka? January's chilly winds and all too brief days call for heavier knits, formal furs to banish the cold and an inferno of fragrance to get through it all; and cold it has been, unusually so this year for this corner of Europe! 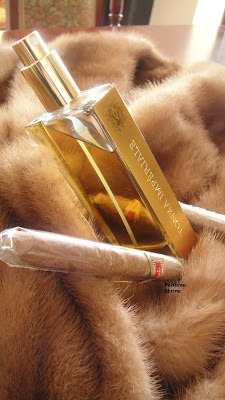 It's also just the time for precious vintages (do a search on PerfumeShrine for plenty of ideas on those) and for parfums fourrure, since putting these perfumes on is as enveloping as donning my fur jacket and you wouldn't don a fur jacket in August, would you? 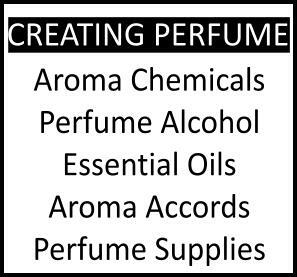 Here are some of the fragrances and other stuff in my rotation this winter to stir the senses and banish (or embrace, if you like!) the cold. Wearing it on winter sweaters and scarfs (where it clings for days, radiating seductively) is akin to getting caressed by a honey mink étole, smelling fine cigars in a salon de thé serving the most delicious almond pralines on panacotta. As warm as a fur coat, as arresting as pepper spray, a pas de deux on clove and carnation blossoms; or the scent of Cruella de Vil. I bring out the sable and pretend I'm wicked! A clean smoky incense that wafts from the forests on the cool wintery air, gloomy cedars silently silhouetted in the distance. Rained upon angelicas, a celestial gin & tonic on the rocks, refreshingly bitter with the cool edge of seeing snowcapped stone fences just across the road. Myrrh gum is part of ecclesiastical incense alongside frankincense for millenia. You would expect an oriental, full of resinous mystery, going by the name, right? Lutens goes one better and infuses the bitter ambience of myrrh with candied mandarin rind and citrusy aldehydes which bring this on the upper plane of an airy aldehydic. Somehow it wears lightly but solemnly too and it resembles nothing else on the market. Cool days bring La Myrrhe's attibutes to the fore and it remains amongst my most precious possessions. I'm also crazy about discovering Nostalgie by Sonoma Scent Studio. There's a sheen sans pareil about wearing a graceful floral aldehydic smack in the middle of winter, everything just seems to sparkle brighter under the tentative sun! In that vein, expect a review of the graceful L'Ame Soeur by Divine and an update on its slightly re-orchestrated reissue shortly on these pages! Winter is also the time to indulge in some body pampering. Heavy oils and unctuous creams suddenly seem welcome, decadent, like a deserved small luxury.This winter I have seriously lost myself into the scentscape of vanilla pods, almonds & toasted cereals of Cacharel's Gloria Bath & Body Oil. I also regularly turn to L'Occitane Creme Ultra Riche, crammed full with shea butter, for all topical dry skin emergencies. Food-wise, winter weekends is the time to make time-consuming, elaborate dishes like Armenian "manti", called Tatar Böregi in Turkey (recipe to follow on subsequent post), full of the warming aroma of all spice, cinnamon, cumin and clove. I also love to prepare home-made halwa with semolina, raisins and roasted pine nuts. Yum! Intellectually I have been stimulated through work mainly this season. But off-work hasn't been totally idle. I took an interest to John A. Hall’s “Ernest Gellner: An Intellectual Biography", recounting the exiling of intellectuals of Eastern Europe because of communism and Nazism. The relaxed pace of an evening by the fire also perfectly fits reading poems by Emily Dickinson and Kostas Karyotakis thanks to their slow pace and melancholy. I also caught The Girl with the Dragon Tatoo in cinemas this winter: It's atmospheric and suprisingly loyal to the original Swedish version, so if you need a rec, go watch it! All I am a Redhead, I smell therefore I am, Katie Puckrik Smells, The Non Blonde, Under the Cupola, Waft...what a fragrance fanatic thinks. The clip comes from the 2004 film "Weeping Meadow" (Το λιβάδι που δακρύζει) by Greek film director Theo Aggelopoulos, who died last Tuesday. Music by Eleni Karaindrou. 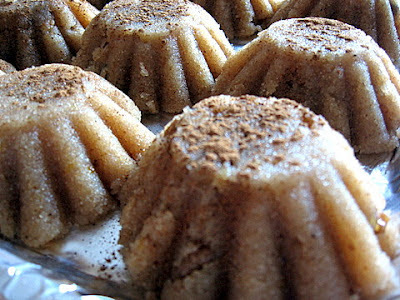 Homemade Halva, YUM! I love your photo of Tonka Imperiale resting in fur...divine. 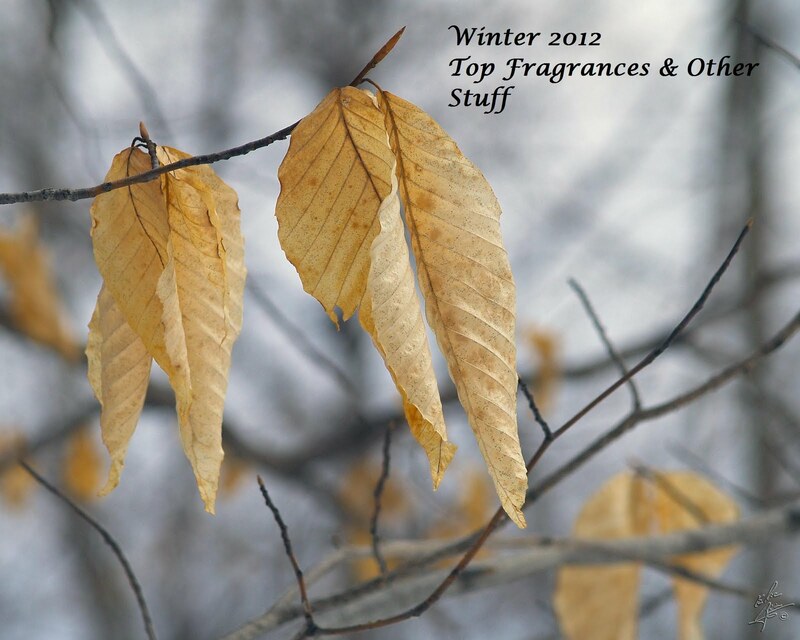 My personal favorites for winter are Amouage Lyric (but it is even better in summer) and L'Artisian Havana Vanille. I'm going to have to try Guerlain's Tonka Imperiale. Thank you so much for the film clip. All nations and noses and musicians and dancers and songs from the Black Sea have my heart. Love your list. Can't wait for the recipe. I tried that Malle ages ago and remember it being masculine and vegetal. I wish I still had my sample. Would you agree that it leans more towards the masculine end of the spectrum? Also am curious about that SSS. It's getting so much talk these days! I'm loving so many things....Guet Apens, 180 Ans, PG Tonkamande and Praline de Santal, Myrrhiad, the soon to be d/c'd Iris Ganache, Indochine....the list goes on and on. What an imagination-stimulating assortment of goodies. Now I wish I had Bois d'Encens to wear. The Prive line has disappeared from Armani perfume counters. thanks for saying so, it's just so nuzzly for a winter perfume, isn't it? Quite sweet but in a good way. Halwa/Halva is delicious, nutricious and rather easy to make, really. Worth devoting an hour to it IMHO. you're welcome, it was a small tribute. He left behind such a multi-nuanced, symbolic opus. But to give a simple answer, yes, it's a bit masculine. Nostalgie is getting much talk now because it just launched; some of us who got a preview sample were excited and talked about it and now people are discovering it themselves. Justly so, as it's truly lovely (honestly, hand to heart)! Love your choices, very exclusive club of things, but everything top notch! Say, must have missed this, why is IG getting discontinued all of a sudden??? thanks for chimming in and glad you enjoyed. Bois d'Encens is great, don't you agree? Probably the best in the line, though I also love La Femme Bleue (but fat chance I'll ever plonk for a bottle). How odd that they're disappearing, really? Why? 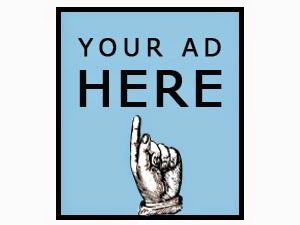 I recall they were introduced at a local big & "exclusive" department store with much fanfare a couple of years ago. Need to ask at the Boutique Armani itself what's going on with distribution. yeah, it's amazing! Poivre is reserved for Caron boutiques, but I'm sure that there's a lot of decanting business going on for Caron extraits, so you can get your hands on it. Halwa recipe coming up, promise! Oh my, IG and Vetiver pour Elle are both being axed. I can't say I know why. IFRA involvement? No idea. It isn't right, particularly as in an article not two years old, Sylvaine Delacourte informs us that IG is becoming a top seller in Japan. Devastating. 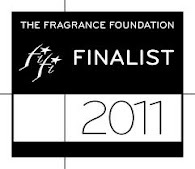 I agree that we perfumistas wear whatever we choose, regardless of gender marketing. Isn't it wonderful? And thanks to your article, I remembered my neglected bottle of Bois d'Encens. It's so gorgeous. --Addendum: Vetiver pour Elle will not be d/c'd. For some reason, it's been removed from the website but will still be in production. Love the term "parfums fourrure" - that perfectly sums up some of the winter scents you describe! 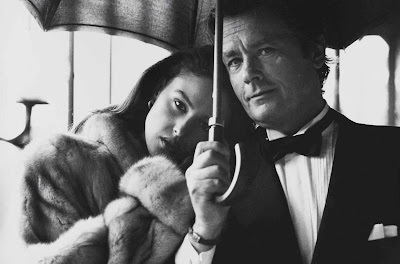 I don't know all the ones you suggest, but am partial to several of them, notably Bottega Veneta and Tonka Imperiale, also Angeliques sous la Pluie in a different winter genre, and am most curious about Nostalgie.